My Mothman Coasters were a big hit! What a wild ride this weekend turned out to be! On Saturday and Sunday, my boyfriend and I made the drive into Pt. 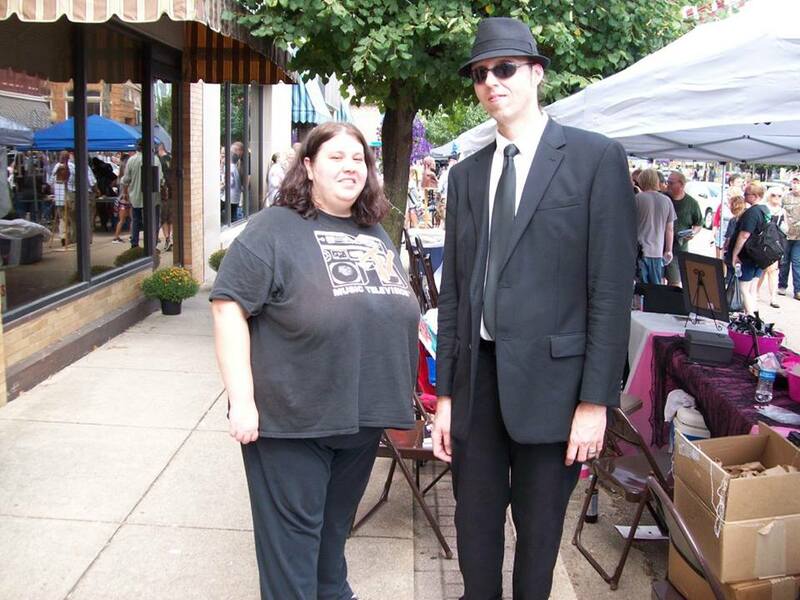 Pleasant, WV to represent Theresa's Haunted History at the annual Mothman Festival. With this year being the 50th anniversary of the original Mothman sightings in Pt. Pleasant as well as the festival's 15th year, I knew it was going to be a big one---I just had no idea HOW big! An estimated 10,000 visitors poured through the streets of the small town, many there to see the cast of Mountain Monsters. Wait times to see the AIMS crew went upwards of 6+ hours, but every single person I talked to said the wait was worth every minute. The AIMS crew stayed until after 10pm that night, making sure that every last one of their fans got some personalized attention. As for me, I didn't get to do much looking around on Saturday because I was so busy manning my own table! I had an excellent time chatting with those who recognized the blog, some familiar faces, and some totally new to my work. I also sold a TON of handcrafted items! To rent a vendor's table wasn't exactly cheap, so even though my main focus was to draw attention to my website, I thought I'd sell a few things to help recuperate my costs. I ended up covering the entire cost of my table and then some, selling items priced from 25 cents to $5, lol. 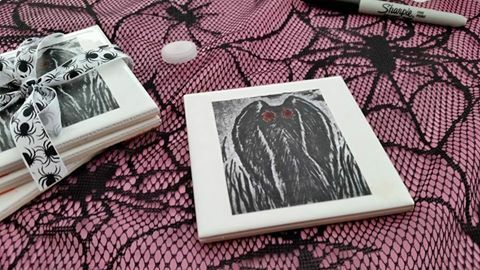 I actually sold out of ALL my Mothman themed merchandise the first day, and had to go home and make more! Sunday was a little less successful. The day started out super rainy and there were only brief, intermittent periods of cloudy sunshine. Many vendors chose not to return on Sunday, or either came late or left early. Since attendance was a little lower that day, I got a chance to look around a little. I bought some used books and chatted a little with some of the other vendors. I was absolutely fan-girled out when Susan Shepphard of Parkersburg Ghost Tours came over and talked to me! Seriously, if you haven't checked these tours out, you NEED to this year. Unfortunately, I missed my favorite part of the festival---seeing the top-notch speakers who present a variety of paranormal topics at the State Theater throughout the weekend. I have said this hundreds of times, and I can't say it enough: there is NO other festival in the country where you are going to see the level of speakers in one place...and for FREE! Rosemary Guiley, Loren Coleman, Nick Redfern and Ken Gerhard are just a FEW of the presenters who gave talks. I was also very lucky to have a table beside another presenter, Cameron Jones. Cameron is a researcher specializing in the paranormal/cryptozoology/ufology and gave a talk about UFOs in the Pt. Pleasant area. Based out of Ohio, Cameron was a really nice guy, and I enjoyed getting to know him, as well as the author on my other side, Roger W. Russell, who wrote a book about local ghost tales. I would have totally bought a copy, if I hadn't already did so the year before, lol! All in all, it was a super successful weekend, and I can't thank Jeff Wamsley, Ashley Wamsley-Watts, and the many, many others who worked so hard to make this festival a reality. I know it got super crazy at times with so many people in attendance, but everyone did a great job, and I kept hearing how nice and polite everyone was treated. We've already made plans to be back next year! I didn't get a chance to take many photos, but please check out this short video shot by my boyfriend, Aaron!